Trisha started at BRS Architects in October of 2005. 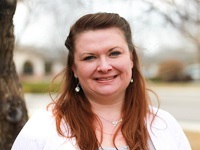 She began as our Administrative Assistant and has since transitioned into the role as our Office Coordinator. You will find her at the front desk greeting all clients with a warm welcome to the office. Trisha is known for never forgetting a name, regardless of the amount of time that has passed. Her key skills include; scheduling appointments, lunch and learns, maintaining licenses, accounts payable, form creation, managing employee timesheets, filing, copying, and general administration. One of her funny little quirks is how easily she can be scared when a co-worker walks around the corner to her surprise. On her days off you can typically find her with her son Hunter riding bikes on the Greenbelt, hiking, swimming or working in her garden.